Wolfgang Bauer is a Vienna, Austria born painter and artist. 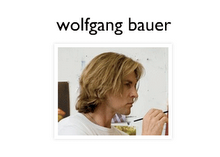 Welcome to the beginnings of the Wolfgang Bauer blog. Here you can keep abreast of my latest shows, new work, press coverage, inspiration, and more. For those of you who don't know me, here is a quick biography: Born in Vienna, Austria, Wolfgang Bauer currently lives in Los Angeles. Bauer is well known for his expansive and evocative oil canvases. He holds a degree in Fine Arts, Gender Studies, and German Literature from the University of Southern California. Wolfgang also studied at the Hochschule fuer Musik und Darstellene Kunst, (Max Reinhardt Seminar, Vienna Austria), and at the Universitaet fuer Musuk und Darstellende Kunst (Mozarteum, Salzburg, Austria). You can also find additional information about my upcoming show at Found Gallery.